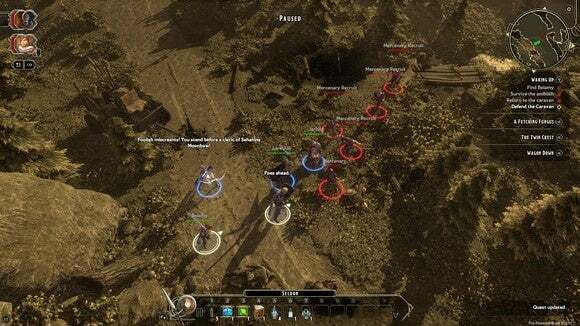 We’ve only had review code for Sword Coast Legends for a few days, and I’m far from finished with it. I’ve put maybe ten hours into the campaign so far and a few more into random community-created campaigns and dungeon creation. But given that the main story is apparently forty or so hours long and the game’s most important component—live multiplayer scenarios run by a Dungeon Master—will only really get underway after today’s release, we’re not prepared to tack a score on yet. I do have some off-the-cuff opinions though, if you’re trying to make up your mind whether it’s worth the buy. 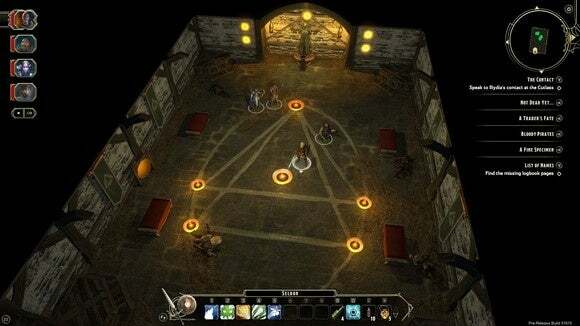 It’s testament to the resurgence of the once-dead isometric CRPG that I now call the Sword Coast Legends campaign “serviceable.” Two years ago I would’ve been overjoyed to play this. Now? It’s okay. Not bad really, but it doesn’t hang with the competition. The game’s greatest strength is that official Dungeons & Dragons license. Heading back to the greater Neverwinter area feels a bit like coming home, and long-time fans will delight in throwaway references to all manner of D&D lore. I laughed when a beggar tried to sell me “one of Drizzt’s buttons”...which he’d taken off his own shirt. We’ve had a glut of wonderful isometric CRPGs in the past year, though—so many, it’s almost like 1999 never left. Sword Coast Legends doesn’t do dialogue as well as Shadowrun: Dragonfall, it doesn’t do reactivity as well as Divinity: Original Sin, it doesn’t do world-building as well as Wasteland 2, and it doesn’t have the old-school (some might say overwrought) charm of Pillars of Eternity. The two-hour prologue in Sword Coast Legends is particularly grueling, thanks to half a dozen fetch quests and an extremely linear set of caves to battle through. It’s light on dialogue, light on atmosphere and storytelling, and heavy on low-level/low-capability combat. The game’s gotten progressively more enjoyable since reaching the major city of Luskan, though. There are more areas to explore, more people to talk to, and the main plot is starting to finally pick up the pace—ten hours in. I’ll keep playing it. Some adjustments I recommend making: Configure your auto-pause options to play more like Baldur’s Gate if that’s the style of game you’re looking for. Otherwise the game will pretty much never pause unless you do so manually, and you’ll end up watching as your AI companions stumble through the trap you just discovered. And if you have any sort of fondness for your ears, I urge you to go into the audio menu and turn down the Selection Sounds and Command Sounds. It doesn’t actually change the volume, just the frequency of repetition. Leaving it at maximum means literally every single time you select or click to move your character he/she’ll say “Okay,” or “At your service,” or “If you say so,” or some other obnoxious bark. 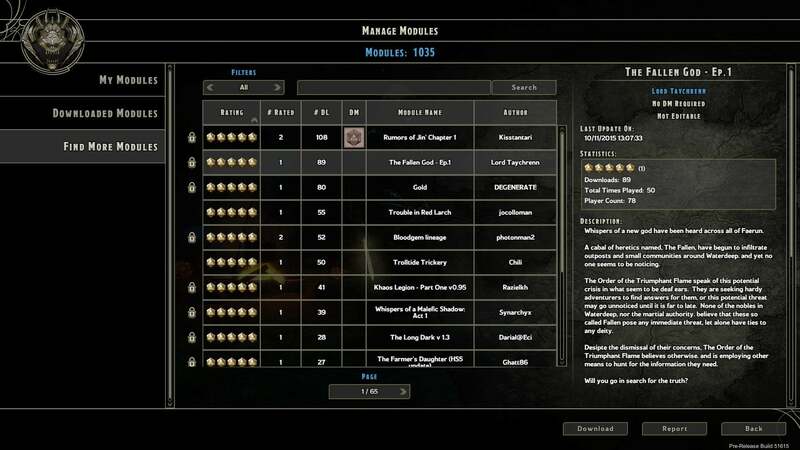 But the big draw of Sword Coast Legends, at least for me, was the promise of four-versus-one multiplayer. Four party members trying to navigate challenges laid out by a Dungeon Master—not a competitor, per se, but an entertainer. An enabler. Someone who provides just enough of a challenge to keep things interesting, but not-so-secretly hopes the players will succeed. That human element, that authorship, is what keeps me coming back to tabletop gaming, and it’s something that barely exists in video games. And what I was really looking forward to were the custom campaigns. Dungeon crawling is one thing, and I’m excited to run some dungeons with a full party and a DM post-launch. Dungeon creation is quick, it’s easy, and seeing the DM change stuff up on the fly to rebalance the level is a really great implementation of tabletop’s “DM fudges the dice roll” moments. I expect to have a ton of fun running dungeons, both with friends and (hopefully) with strangers. But those are just straightforward combat scenarios. I want new, user-created stories. I want creative scenarios. I want personality. 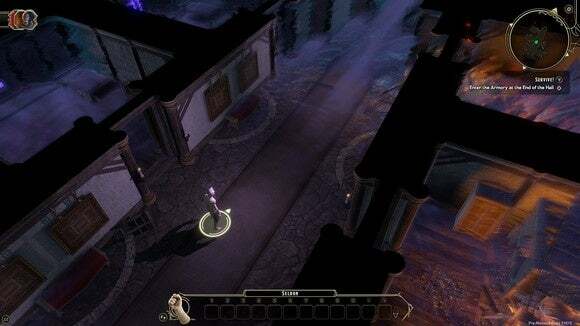 Sword Coast Legends goes further in this regard than any RPG since Neverwinter Nights, and I look forward to seeing what people make and how they get around the game’s limitations. But unfortunately, there are a lot of limitations. This isn’t Neverwinter Nights 3. The biggest is that campaigns are seemingly constrained to a certain number of maps, which has already flooded the market with a bunch of modules taglined “[Insert Adventure Name] PART ONE,” as you can see in the screenshot below. 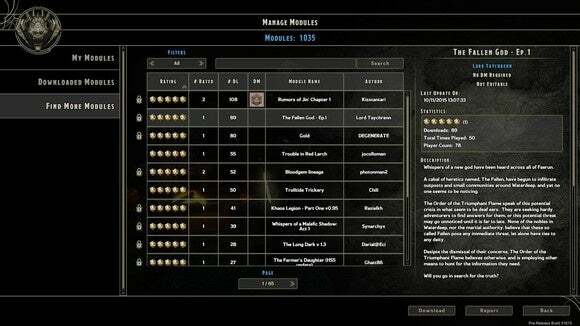 You can’t have much in the way of persistence or world progression the way Sword Coast is currently built. You’re also stuck with around two-dozen map layouts. There’s no full-fledged tile editor or anything. Rather, you choose a pre-made map and fill it with props. And the maps you can choose from have some weird oversights. You can’t just “make an inn” for instance—that most perennial and obvious of RPG settings. 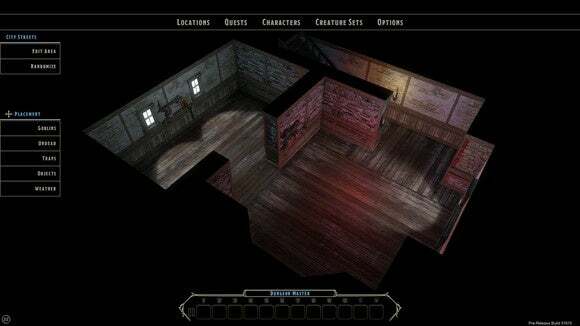 Instead you have to find a City map with a clickable door, click it, see if the interior is big enough to maybe sort-of pass as an inn, and then fill it with props/people until it looks like one. Like this empty husk which I think I found on the City Streets B map. Again, I fully expect people to make some great campaigns. The tools are easy to use, and it’s fun to mess around in. But I think the time investment is still too high for normal players to be interested in creating anything serious, while those who would build amazing things will largely be frustrated with the obvious limitations. And what’s given me the most pause, I guess, is my fear that the obvious holes (a few missing races, some obvious limitations to the tilesets) are ripe for DLC. I don’t know if the developers are going that route, and I wouldn’t even necessarily blame them if they do, but I nevertheless dread a potential onslaught of prop packs, map layout packs, and character packs hitting Steam in the future. One last note: I have some major issues with the game’s performance. Namely, on my laptop. The MSI Ghost Pro I’m using is equipped with a 970M, but even on Low settings Sword Coast currently runs at an average of 18 frames per second. That’s abysmal, especially considering the game doesn’t look all that spectacular. I don’t know what’s causing the issue, but if you’re running mainstream-level hardware (or a gaming laptop) be aware you might be faced with a similar issue. UPDATE/CORRECTION: Just Windows/Nvidia being screwy. Now getting acceptable frame rates on the laptop, and apologies to n-Space for the mix-up. I’m enjoying Sword Coast Legends, but less than I’d expected. For once, I don’t feel like “depth” is the issue. It’s breadth. If campaign creation is going to take off (and I hope it does) I think users need more options and more flexibility—else-wise, they’re going to get frustrated when they realize what they thought was a wide world of possibilities is actually a cleverly-disguised illusion.